Chinese President Xi Jinping has urged accelerating development of military equipment systems to help build a strong army. Addressing a conference of the People’s Liberation Army (PLA) on equipment, held from Wednesday to Thursday of December 4, Xi said advanced weaponry is the embodiment of a modern army and a crucial support for national security and rejuvenation. The building of equipment systems should be information-led and pay great attention to weapon quality, said Xi. Equipment systems are now in a period of strategic opportunities and at a key point for rapid development, he noted. The PLA must understand and make plans for system building in the context of the changes in both international strategic structure and Chinese national security. A strong and modern army equipment system plays an irreplaceable role for the full realization of the Chinese Dream, Xi said, adding that the PLA must enhance political consciousness to seize the opportunity and ensure the rapid upgrading of equipment. The equipment must be innovative, practical and forward-thinking to meet the demands of actual combat and fill in the weak spots of China’s existing equipment. Military officers at all levels should play a leading role and use actual combat to guide soldiers to improve their capacity to operate weapons, Xi said. Xi, also chairman of the Central Military Commission, said the PLA should put a human resource strategy first by opening minds and not following a set model to establish a highly competitive talent reserve. China’s ambition for a strong military works as a guideline for the country’s defense and military equipment modernization. “We expect peace, but we shall never give up efforts to maintain our legitimate rights, nor shall we compromise our core interests, no matter when or in what circumstances,” Xi said earlier this year when joining a plenary meeting of the PLA. In the meantime, national conditions have also dictated that a well-equipped PLA is needed for multiple purposes domestically, from disaster relief to maintaining stability and national unity. Xi, who leads the country’s reform on national defense and the armed forces, stressed that military reform should be guided by the objective of building a strong army. New rules released by the People’s Liberation Army (PLA) show its toughening stance on duty crimes in the areas of construction, and materials and armament procurement. The PLA rules, which came into effect on Monday of December 1, detailed 44 high-risk links and more than 130 outstanding problems. It set clear preventative measures in 71 clauses under ten chapters. The key fields identified included personnel and finance management; construction; oil management; material and armament procurement; health care; real estate; and reception services. More than 90 percent of duty crime cases in the military occurred in these key fields, the PLA Daily said on Sunday, citing an unnamed military procuratorate officials. Such cases often involve high ranking officials, huge amounts of money and are often related to other cases, and all disturb order and damage the military’s reputation, said the official. These key fields concern combat effectiveness and greatly affect the military’s development, he said, adding that rooting out graft in these fields was a top priority. The common crimes identified include embezzlement, bribery, unauthorized partition of state property, property, abuse of power, dereliction of duty, unauthorized trading of military real estate, the leaking of military secrets and other crimes that take advantage of one’s duty. The rules also put forward clear requirements on preventative mechanisms, warning and punishment system, as well as the functions of disciplinary, auditing and other relevant bodies. The move is part of the PLA’s wider war on graft, with several top-level generals already under investigation for legal and disciplinary violations. The military watchdog is activity probing “some PLA members”, said a National Defense Ministry spokesman last week. The PLA last year began to examine the working practices of its organization more closely, to play its part in the Communist Party of China’s (CPC) wider campaign to root out extravagance and corruption. Previously unquestioned habits, such as gift giving, vehicle use and travel are also being scrutinized. Former vice chairman of the Central Military Commission, Xu Caihou, has confessed to accepting bribes, said military prosecutors in October. Xu was found to have taken advantage of his position to assist others, accepting substantial sums of money personally and through his family. He sought to profit from others in exchange for “extremely large” backhanders, according to a statement from the military procuratorate. The People’s Liberation Army (PLA) is getting tougher on corruption, reflecting the Party’s resolution to “purify” the army. Currently, the military watchdog is conducting an investigation into suspected violations of law and discipline of “some PLA members” as the military digs deep into the anti-corruption drive, said a Ministry of National Defense spokesman on Thursday of November 27. Duty crimes are the most serious type of corruption and are the root of the PLA’s current unhealthy work style, the commentary said, urging prevention of job-related crimes in key sectors. With great power comes with great corruption risks. Too many temptations and traps surround official posts in China, which become high risks if officials don’t have self-discipline. The cases of former Central Military Commission (CMC) Vice Chairman Xu Caihou and Gu Junshan, former deputy head of the PLA general logistics department, harmed the military’s reputation. Resolutely dealing with graft cases reflected the Communist Party of China (CPC)’s determination to build a clean army. 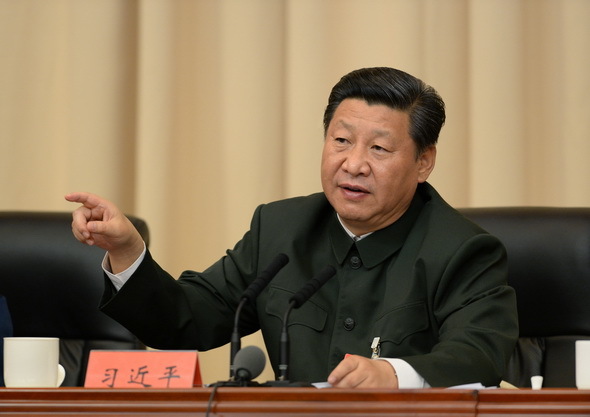 President Xi Jinping, also general secretary of the CPC Central Committee and CMC chairman, called for serious reflection on Xu’s case. Xu confessed to taking bribes, military prosecutors announced last month. Lessons from Xu’s case deserve reflection and the unfavorable influence of the case must be thoroughly cleared away. The PLA must be run in accordance with law and discipline, which lays a solid foundation for a strong army. The Chinese army has the tradition of enforcing strict discipline during its 87 years of history, but it is far from achieving comprehensive rule of law. The lack of external inspection and supervision of the military gives rise to problems such as squandering, graft and loopholes in the military’s legal system have become lucrative opportunities for personal gains. Top military leaders are no exception. Xu was found to have taken advantage of his position to assist the promotions of others, accepting huge bribes both personally and through his family. He sought profits for others in exchange for “extremely large” bribes, according to a statement from the military procuratorate. The PLA has stepped up oversight of its officials since last year, part of the CPC’s campaign to root out extravagance and corruption. Officers’ daily habits, such as gift giving, vehicle use and travel are also subject to close scrutiny. All officers, no matter their rank, must follow rules. The army should be built under the rule of law and power should be shut in a “cage of regulations” as irregularities will destroy PLA’s combat capability. working rule to prevent duty crimes was recently issued by the Chinese army and will be put into operation on December 1. The rule was jointly issued by the General Staff Headquarters, the General Political Department, the General Logistics Department and the General Armament Department of the People’s Liberation Army. The rule focuses on some key fields prone to corruption, including personnel, finance, construction, oil management, materials and armament procurement, health care, real estate, and reception services. It makes detailed regulations for 44 high-risk links and over 130 problems that should be noticed, and sets clear prevention measures one by one. The rule also put forward clear requirements on the building of prevention mechanism for duty crimes, strengthened warning and punishment system, as well as the functions of disciplinary, auditing and other bodies. The rule came as the PLA is launching a war against corruption, with several top-level generals being investigated for suspected serious legal and disciplinary violations. 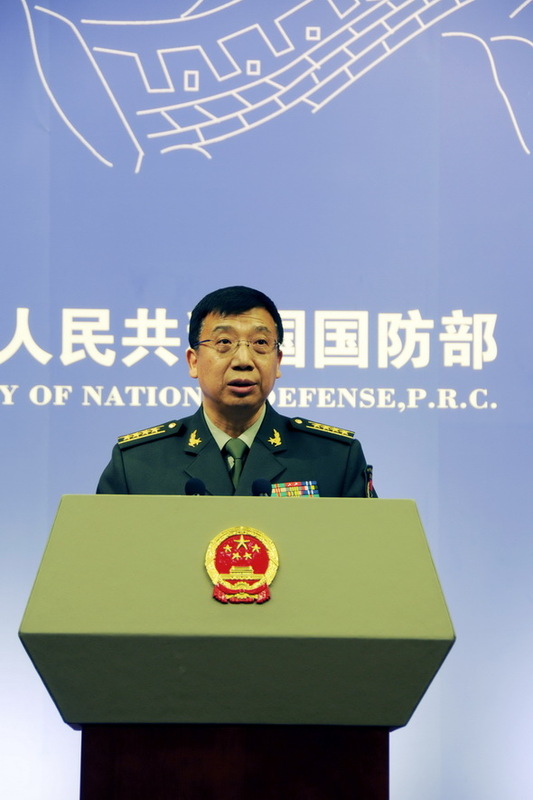 The military watchdog is conducting an investigation into suspected violations of law and discipline of “some PLA members” as the military digs deep into the anti-corruption drive, said a Ministry of National Defense spokesman on Thursday of November 27.
spokesman Geng Yansheng speaking at a press conference in Beijing. Chinese Defense Ministry spokesman Geng Yansheng said on Thursday of November 27 that overseas criticism over the Chinese military’s role in fighting Ebola reflects the distorted mindset that a group of people hold toward China. He made the remark when asked at a regular press conference to comment on reports that China sending troops to fight Ebola was a mere show of military strength and an attempt to reinforce influence in Africa. Geng said that a certain group of people were saying China failed to perform its responsibility and allocate adequate resources, and on the other hand they proclaimed Chinese military participation in the aid as protection of the country’s own interests. He said the Chinese military would continue to provide support and assistance within its capabilities for West African countries. The Chinese military completed the construction of an Ebola treatment center in Liberia and put it into operation on Tuesday. China has dispatched hundreds of military medical personnel to the affected countries of Sierra Leone and Liberia. A second batch of Chinese medical staff have arrived in Sierra Leone and are expanding existing facilities into another treatment center. A spokesman for China’s Defense Ministry on Thursday of November 27 denied reports that China was planning to build an overseas base in Walvis Bay, Namibia, the country’s only deep-water port. “We are aware of this report in circulation,” spokesman Geng Yansheng told a regular press briefing, adding that it had quoted an unofficial article, which had been posted on the Internet two years ago, and had exaggerated and distorted the original source. “The report is unfounded,” Geng confirmed. 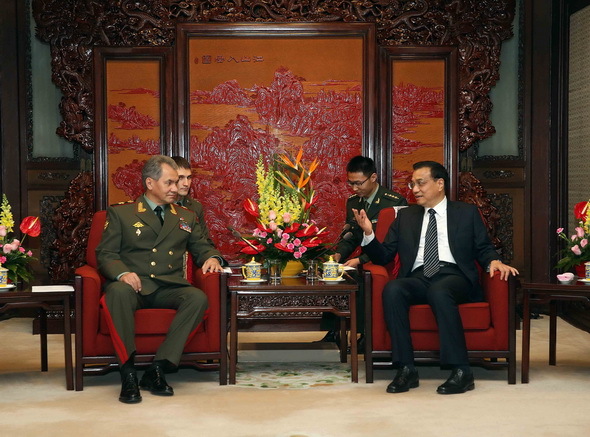 Chinese Premier Li Keqiang met with visiting Russian Defense Minister Sergei Shoigu here on Tuesday of November 18. Li said the comprehensive strategic partnership of coordination between the two countries was built on the basis of mutual respect, equality and reciprocity. China is ready to consolidate mutual trust, promote concrete cooperation, and strengthen communication on major international and regional affairs for a China-Russia relationship which is conducive to peace, stability and development of the region and the world, the premier said. 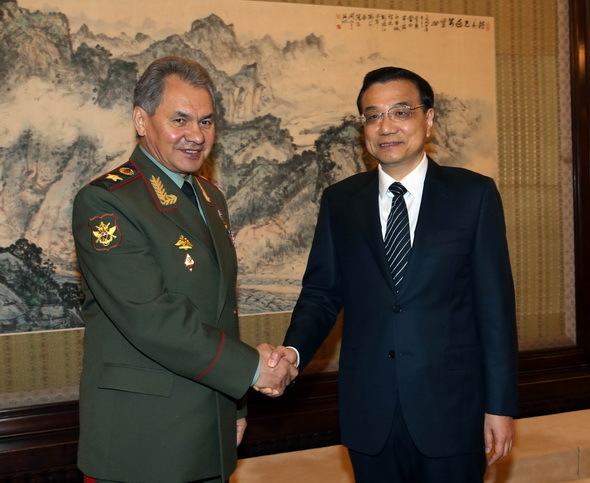 Shoigu said Russia-China relations are of global importance. Russia hopes to strengthen exchanges and cooperation with China in all areas including military cooperation. 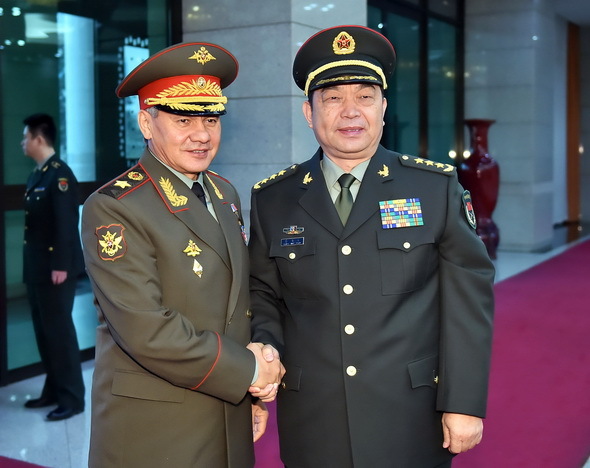 Chinese Defense Minister Chang Wanquan held talks with visiting Russian Defense Minister Sergei Shoigu on Tuesday of November 18 to discuss practical bilateral military cooperation. China is willing to make joint efforts with Russia to implement the consensus reached by both countries’ leaders, promote bilateral military-to-military ties to a higher level and positively maintain regional peace and stability, Chang said. on October 31. A military political work conference is held on October 30-31 here. Chinese President Xi Jinping said the army is under the absolute leadership of the Communist Party of China (CPC) and the principle should always be firmly upheld. “The Party commands the gun,” said Xi, also general secretary of the CPC Central Committee and the Central Military Commission (CMC) chairman, at a military political work conference held in a former revolutionary base in the township of Gutian, Fujian Province on October 30 and October 31. The ideological and political development is the lifeline for military building and has safeguarded the CPC’s absolute command of the troops, Xi noted. The army has established a set of fine political traditions, including serving the people wholeheartedly, fair and honest promotion of officers, rigorous self-discipline and sacrifice to the revolutionary spirit, Xi said. “We must profoundly recognize the important role of political work in the army building and pass on to the following generations all the great traditions which were forged in blood by our ancestors,” Xi said. The president said the military cohesion has been increased thanks to sweeping reform measures aimed at sharpening the army’s fighting capacity and curbing corruption since he took over the general secretary of the Party in 2012. To strengthen the army’s ideological and political development, Xi urged the troops to have a strong sense of Party principles and interests, giving priority to the CPC cause and the people’s interests. “Fighting capacity is the sole criterion for testing the troops and military officers’ assessment and promotion will focus on their ability of leading soldiers to fight and win battles,” said Xi, vowing to tighten the management of high-ranking and middle-level officers in the army. 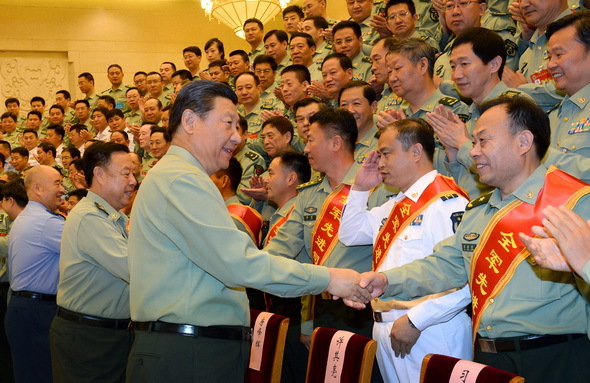 “We’ll never slacken the efforts to deepen the fight against corruption in the army,” said Xi, pledging to purify contingent of cadres and continue effective crackdown on graft in a regular manner. The leadership has launched sweeping anti-graft campaign in the troops since taking office. This week the authority said one of the senior former military officers Xu Caihou had confessed to taking “massive” bribes. Xu was found to have taken advantage of his position to assist in the promotion of others, accepting huge bribes personally and through his family, and to have sought profits for others in exchange for bribes. The amount of bribes were “extremely large”, prosecutors said. Xu was CMC vice chairman from 2004 to 2012 and was made a general in 1999. He has been discharged from military service with his rank of general revoked. Chinese President Xi Jinping has called for serious reflection on the discipline and law violations by former Central Military Commission (CMC) Vice Chairman Xu Caihou. Xu, CMC vice chairman from 2004 to 2012, confessed to taking bribes, military prosecutors announced on Tuesday of October 28. On Friday of October 31, Xi, also general secretary of the Communist Party of China (CPC) Central Committee and CMC chairman, said people should “pay great attention” to and “seriously treat” the case of Xu. Xu was found to have taken advantage of his position to assist in the promotion of others, accepting huge bribes personally and through his family, and to have sought profits for others in exchange for bribes. The amount of bribes were “extremely large”, according to prosecutors. Lessons learned from Xu’s case deserve a profound reflection and the unfavorable influence of the case must be thoroughly cleared away, Xi said at a military political work conference held in a former revolutionary base in the township of Gutian, Shanghang County of southeastern Fujian Province, on Thursday and Friday. Xi visited the old revolutionary base where the Gutian Meeting was held more than 84 years ago, stressing the country should carry forward with hard work and revolutionary traditions. The Gutian Meeting, which was a milestone for the CPC and the army, convened in 1929 in Gutian, Shanghang County of southeastern Fujian Province. The meeting set the tone for the army’s political work during the revolutionary era. The president said the ideological and political development is the lifeline for military building and has safeguarded the CPC’s absolute command of the troops. “We must profoundly recognize the important role of political work in the army building and pass on to the following generations all the great traditions which were forged in blood by our ancestors,” he added. However, Xi noted outstanding problems in the ideological and political development in military construction should be faced squarely. The fundamental problems are with faith, Party principles, revolutionary spirits, disciplines, ideology and work styles, he said, adding that management of officials is “too lax” and the supervision system has flaws. 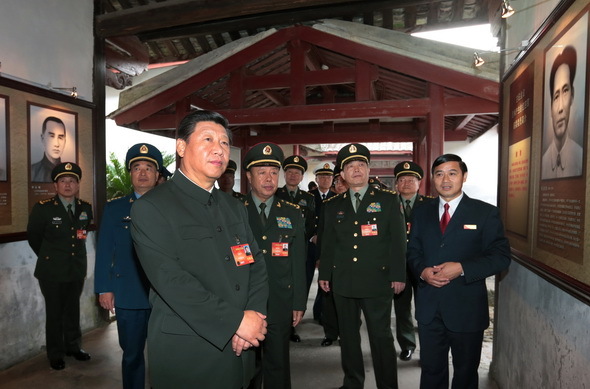 During the trip, Xi visited the venue with other CMC members. He carefully examined pictures and panels, raising questions about the historic meeting. In the office where Mao Zedong once worked, Xi recalled the hard struggle and achievements made by the older generations of revolutionaries. Xi visited the venue seven times during his early years in Fujian. 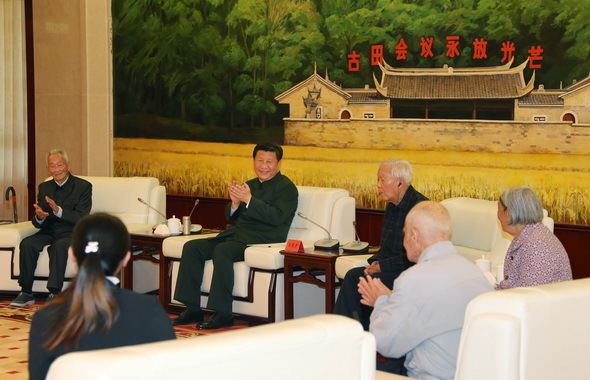 Xi also met with local veterans in western Fujian. He has been there 19 times. He said people should listen to their suggestions to ensure the passing on of revolutionary traditions. President Xi Jinping stressed the loyalty of headquarters of the People’s Liberation Army (PLA) at a meeting with PLA chiefs of staff in Beijing on Monday of September 22. Headquarters of PLA forces must have absolute loyalty and firm faith in the Communist Party of China, guarantee a smooth chain of command and make sure all decisions from the central leadership are fully implemented, said Xi, also chairman of the Central Military Commission (CMC). Headquarters of all PLA forces should improve their combat readiness and sharpen their ability to win a regional war in the age of information technology, he said. The PLA chiefs of staff met in Beijing on Sunday, discussing how to improve the efficiency of military command under new circumstances. 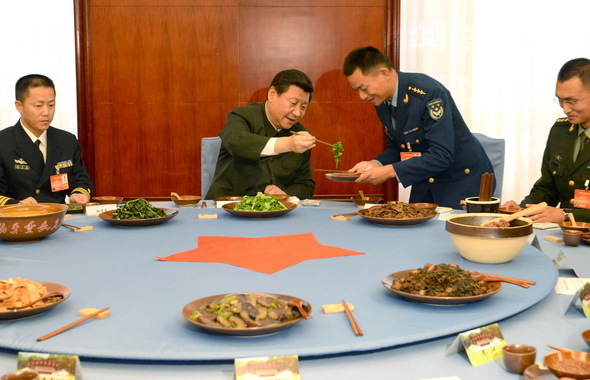 Fang Fenghui, chief of the PLA general staff, attended the meeting. Military commanders should have a better understanding of international and domestic security situations as well as the latest military development, Xi said. They should also strictly discipline themselves and the armies as well as contribute to the reform of national defense, he added. At Sunday’s meeting, PLA chiefs of staff focused on streamlining the operational headquarters of all PLA forces with information technology and revised several important protocols, according to a statement issued afterwards. All PLA forces should follow the instructions of President Xi and update their operations to meet new goals and missions set by the CMC, the statement said.